Work-life balance. Practically everyone on the planet wants it, but not many get to experience it. Why? Well, with rigid working hours, the need to clock in at your workplace, and companies that are complacent about relying on out-of-date business practices, it makes sense that workers would be stressed out as they try to keep up with the demands of their jobs as well as balance family needs, too. In order to have work-life balance and a more cohesive and happier life, your work life and your personal life have to work together, literally, hand in hand. That requires flexibility. Below, some of our readers weigh in on why they want work-life balance. See if you see some (or all) of your own reasons in their remarks. To work when you’re at your peak. Some people get their best work done in the early hours of the morning. Others get their creative juices flowing at 11:00 pm. But if you’re stuck in a regular 9-5 job, chances are you miss out on the time when you’re most optimized to work. There’s a lot of debate as to whether a person can have it all. Can you truly have a career that you love and also be present in your personal life? Some say you can have it all, but not all at the same time. But if you think that you can only be a good worker or a good family member, think again. 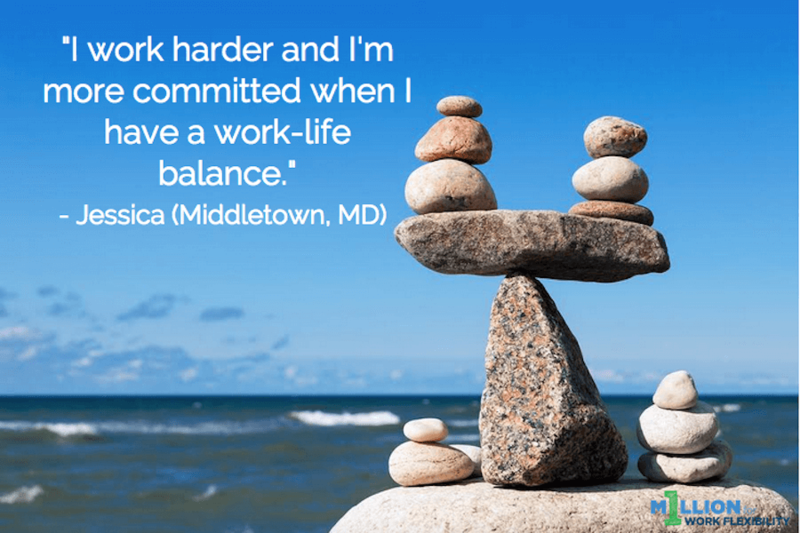 Having work-life balance can ensure your path to career success as well as personal happiness, making you feel like a complete person. If given the choice to be a rock star at the office or at home, which would you choose? It’s a hard decision to make. But when you have work-life balance, you’re not faced with having to choose between a promotion or being a great parent. In short, you can be a rockstar at the office and at home, too. When you’re in balance, you know it. You feel relaxed, happy, and healthy. But when things get out of whack (and that can happen in the blink of an eye), you can feel unbalanced and unhinged. Those feelings of stress, frustration, and failure can wreak havoc on your health. There’s potential for remote work opportunities and flexible jobs in nearly every career field. But many employers and managers haven’t accepted flexibility as a viable option, often forcing talented employees to make a choice between family and work. Work-life balance means not having to choose one over the other. Work-life balance may be tough to achieve, but it’s impossible without work flexibility. Don’t sell your dreams of having it all short—work-life balance is attainable, provided flexibility is leading the way.